The trials,tribulations and occasional successes of a craft addict. I know..it is a bit of a shock! It's been a long while since I posted, but the urge just came over me! Yes, I am posting and I know it's been a long, long time since I did, but I'm hopefully going to keep posting more regularly now. I think the blog will be different and just be about all the things I do, not just fibre stuff, but my other interests too. Last year was a rough year for me and my family in many ways, but I promised myself that the New Year would herald a new start, and so far, things are definitely on the up! As usual, I've been dabbling in various crafts, trying new ones, just in case I didn't have enough to play with! I've started a quilt, in a Grandmas Flower Garden style, using recycled clothes from the family, which make it a memory quilt too. 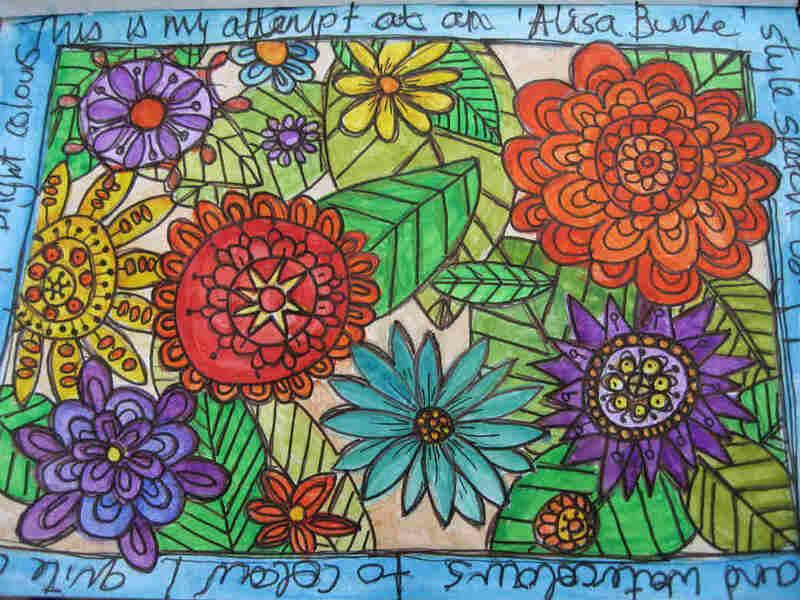 I've made all the 'flowers', but now I have the 'pathway' to add, to join all the flowers into a quilt. ﻿ I was inspired to try quilting after visiting Beamish museum when the Quilting Guild had an exhibition. It showed old quilts and a modern interpretation of each one. It was amazing and the quilts were so beautiful, some of the older ones looked so modern and fresh. So thats what sparked my foray into quilting﻿! I also went to an exhibition in Bishop Auckland town hall, by the Embroidery Guild called Mining A Golden Seam. This exhibition absolutely blew me away. Id always thought of embroidery as an old fashioned method, used to decorate tablecloths and the like! After seeing this exhibition, I realised just how ignorant I had been with this beautiful form of decoration. There was a huge difference in the interpretation of the title, it was wonderful to see the diversity and fantastic skill displayed there, and 'encouraged' by a friend, Lynn, I decided to do my City and Guilds in hand embroidery! I'm currently 2/3rds of my way thro this course. 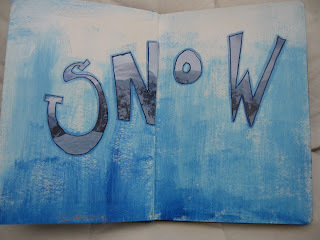 One of my ongoing hobbies is art journalling. I love this genre, and have found it hugely beneficial in the dark days of last year and the brighter ones of 2012. 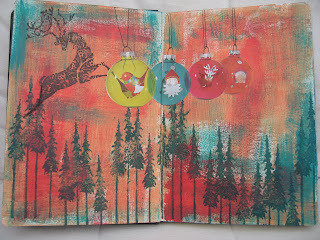 I find it such a release, I can offload, then paint over it and decorate the pages. I also think art as a therapy is wonderful. ﻿﻿﻿ Well I think I've waffled enough for today. I've loads of pics to share, so hopefully won't leave it as long this time! I'll leave you with a photo of a slug! Well I liked it! When you are feeling as though the dark days will never pass and struggling through the mud of life, its amazing what a day with friends can do. I spent a wonderful day last week with two of my dearest friends. We had a day of talking lots, eating beautiful food and even managed to squeeze in some crafting!! It lifted my spirits so much. Since that day I've made some cards, sketched, done some watercolour painting and knitted a bit more of my sock! My knee has been giving me trouble for the past few months and I finally got to see a physio at a Joint Assessment clinic, who informed me I had a subluxating patella!! Sounds much more painful than a 'dodgy knee'! It can be simple to fix with exercises and ice packs but these need to be done for up to 6 months. So I need a way to remember to do the exercises 3 times a day. Any ideas? The dafter the better!! Thank you for your comments too, they are much appreciated. The problem with having a room for all my crafting goodies is its just too easy to stash another purchase in, and think, 'well I'll use up the other stuff first' and then close the door. Then I buy something else, think 'well I'll use up the other stuff first' and....................you get the picture! As stuff piles up it gets stuffed into any available space/drawer/basket/bag and as I have, on a good day, a 6 second memory, I forget about it!! Well, I was forced into tidying my craft room, firstly cos I promised my baby bro I would make his wedding invites and he and his fiancee have named the day but mainly because I couldn't find enough clear space on the floor to put two feet down at the same time! Anyway, this led to a voyage of rediscovery. Yarns, fibre, stamps and even a yoga mat were unearthed, I felt like an archaeologist digging up long forgotton treasures. So I took Daisys suggestion (Thanks Daisy!) and decided to start a small project. I decided on some mindless socks in a Posh Yarn of long forgotton colourway. But for the odd occasion when my brain could retain a pattern, I decided to start the Lace Ribbon scarf on Rav using some Colinette Jitterbug sock yarn. As you can see from the photo, the pattern retention occasions haven't happened too often! But I'm pleased I've just got going!! I have also started looking at my blank canvases, haven't got much further than that yet, but the creative thoughts are beginning to rise to the top of the mind treacle!! Theres hope yet!! Half A Century And Not Out! Due to a recent birthday, I am now entitled to life insurance without a medical, special deals with Saga, I have joints that are more accurate weather forecasters than the BBC and I would be likely to be released first in a hostage situation, so who said getting older was all doom and gloom! Tom and Kate had a cake made for me to mark the occasion and it was a brilliant knitterly one! I was still in bed when they gave it to me and that meant that that night before I could lie down, I had to pick lots of crumbs and bits of icing out of the bed! But it was worth it!! I also want to say a huge thank you for your kind and thoughtful messages. For all I still feel I need solitude, it is so comforting to know there are friends there who understand and are prepared to listen when I'm ready to talk. It means a lot. The wind has definitely gone from my sails at the moment, for reasons I won't go into and it feels like my creative mojo along with any motivation I had, has been loaded into a cannon and shot into the wide blue yonder. I think I'm feeling a bit sorry for myself and doing absolutely nothing at the moment, but it can't stay like this, I hope anyway. I did get the hottie cover finished but I haven't took a photo yet. I keep thinking about starting some knitting, I've got hoards of laceweight, but that's about as far as I get. I might have a look on Ravelry and see if anything catches my eye. My brother is getting married in August and has asked me to do the invitations etc. Its a bit hard at the minute but I need to get them done. It might help distract me and stop me wallowing in self pity. Before I go, I just want to say to Carrie and Lynn, thank you for everything, for being there, for listening and just for being wonderful friends. It means so much. The third Monday in January is, according to statistics, the most depressing day of the year! Mmm, maybe they are right! 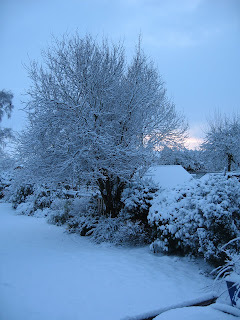 To banish those blues, I decided to put some pics on my blog and cheer myself up! I've finally taken a photo of Ians Christmas socks, not the best picture, but where are all the foot models when you need them? These were knit in Lana Grossa mega boot stretch, or mega stretch boot or something!! I haven't done much knitting this week so my hottie cover isn't growing too fast but I'm nearing the ribbed neck bit so it shouldn't take too much longer. My art journal is filling up nicely too, I'm really enjoying this creative release where there is no right or wrong and everything is experimental. 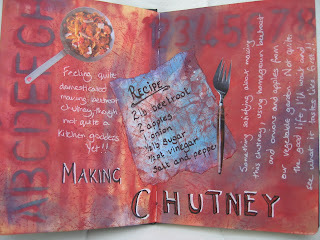 I've put a few pages here but I'm also a member of http://artjournaling.ning.com/. 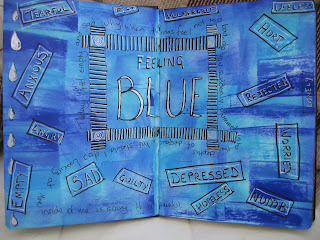 This is a fab site, full of inspiration from fellow journallers and I have my own Artyfartykat page on there where I upload my journal pics. Heres a few of my latest ones. And in true artyfarty style, the next pic is upside down!! Now I know why it's called Blue Monday!! Aaaaaaarrrrrgggggg! Maybe uploading pics wasn't the best way to cheer myself up!! I've had the dreaded flu bug this week and whilst I think I'm over the worst of it, I just don't have any energy for housework........well thats my excuse and I'm sticking to it!! So to pass the time, I've been forced *smirks* to journal!! Here are a few of the pages. This page was in my last post with only the background completed. I'm not sure if its finished yet, but this is how it looks at the moment. This is a page about my inability to recall the word I want, when I want ! I've called it word soup. After stuffing my face with anything remotely edible over Christmas, the next page describes how I feel. Its called Shrek with lipstick. Only I can't be bothered to put on the lipstick! I thought I'd have a go at actually drawing something and after watching videotutorials on Youtube, thought I'd try a whimsical self portrait, using lots of artistic license as you'll see !! Then I got really brave and tried painting a picture. And there were no numbers to follow or lines to stay within, it was just me, a loaded paintbrush and my journal! Now you know how c**p I am with technology, but this next photo of the finished masterpiece WAS the right way round and I don't know how to change it! And on a similar theme, I don't know why theres two of this page, but I can't work out how to delete it!! I thought I was doing so well!! OMG! Is it that long since I blogged!! Where does the time go?! It doesn't seem a year since I last posted and I can't promise it won't be another year till the next one, but I'm in a' finishing ' mode at the moment so I'm trying to finish all the various crafty projects that are either half done or waiting to start. And theres quite a few!! For Christmas,my friend Becky gave me her hand dyed yarn and pattern to create a stash bag for Woolfest. Hows that for forward planning!! So I knit it as big as I could and it looks fab, even if I say so myself. The pattern is the Grrlfriend market bag which is free on Ravelry. Its a really simple pattern, a bit fiddly at the start but worth it. I actually finished a pair of socks for Ian too. They were meant for Christmas but only one got finished, so I wrapped it up with an IOU for one sock and cracked on with the other which he got a couple of days later. I don't have a photo yet as they are in the wash because Ian wore the one I'd finished on Christmas day with an odd sock on his other foot!! I thought it was a good look! 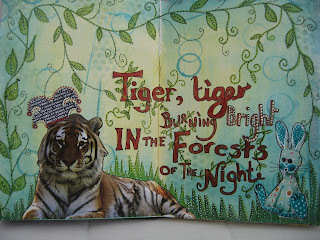 I've also hit the art journal with renewed enthusiasm and finished a couple of pages that I started an age ago. 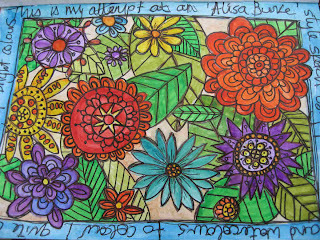 This was just using felt tipped pens,I love colouring in, it takes me back to my childhood! OOps! I did turn it, honest! On this one I used a dye ink pad and some magazine clippings. Then I got the urge to splash some paint about, so out came the acrylics and stencils and bits off envelopes. This is one of the backgrounds I painted, but its yet to be finished! It's on the list!! 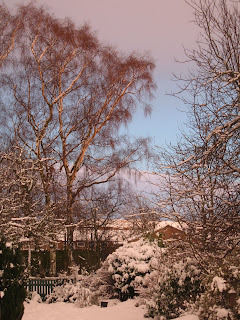 Its going to be a page moaning about our postal service and the snarl ups that snow caused. I'll get it all off my chest!! 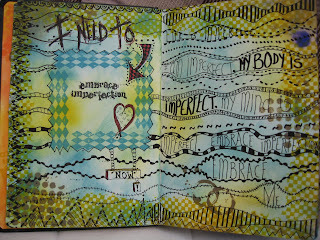 I love the freedom of creating art journal pages and it is very cathartic. Its a great outlet for emotions I don't want to inflict on others!! So I'm off now to start a hot water cover with some merino I spun early this year. It was destined to become a scarf, but I am sick of burning my back when I use my hottie to ease my back problems, so the scarf was frogged and hopefully a supersoft cover will emerge!! So Happy New Year, may it be a happy, healthy one and no promises but I'll try not to leave it so long till next time!! 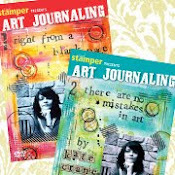 Just when I thought there couldn't possibly be any other crafts crammed into my life, up pops journaling and I lay the blame firmly at the door of the fab Lynn aka http://inkyartitude.blogspot.com/! And I am SO grateful!! It is wonderfully relaxing and freeing and I love it! 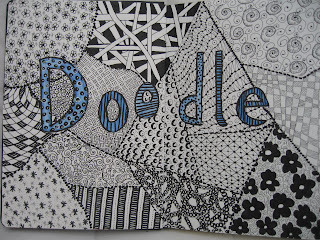 I must also mention another lady whose blog is http://www.thekathrynwheel.blogspot.com/. I find her art work SO inspirational, especially her use of colour and it has encouraged me to become much more adventurous. There are pages in my journal that I like better than others and some I just don't like at all. Some I keep going back to and doodling, some I might paint over, but what I love about it is, IT DOESN'T MATTER!!! Heres a few pics, a mixture of finished and unfinished pages and even just painted backgrounds, some I like, some I don't but I don't care, I allow myself not to like them!! At last the snow has melted away but as I uploaded the journal pics from my camera, I found some snowy ones I'd forgotton I'd taken. I love the differences in light. 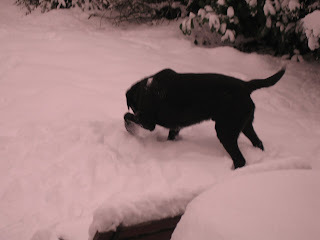 I also found these photos of our poor underfed pooches, who are so starved, they have to dig for bird food that has been covered up by the snow!! Please don't phone the RSPCA, I promise to feed them honest! 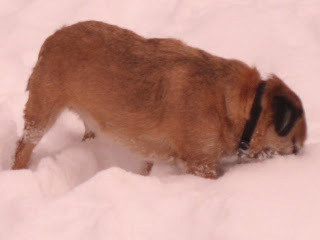 Paddy digging for any morsels he can find! You can see just how thin Alfie is!! Ha! Back to the journaling then! Where did 2009 go? It seems that as I'm getting older, the years just seem to fly by quicker and quicker! and lots of snow drifts! But we made it.........to the pub!! The pub up there (which, by the way, is the highest in Britain and has featured in the Everest double glazing ads!) provided some very welcome food and drink, all of which was enhanced by a roaring coal fire and two gorgeous kittens! The drive back was even hairier than the one there, but Ian, who is a brill driver anyway, excelled himself, and we got home safely. I know it wasn't the most sensible thing to do, especially as I'm usually Mrs Sensible with added anxiety, but for once I threw caution to the wind, it was exhilarating and I loved it!! Wishing everyone a healthy, peaceful and happy New Year! Warning; This post was written ages ago and has been slumbering in the draft box, waiting for the photos to be uploaded, so beware, there will be another post coming soon!! 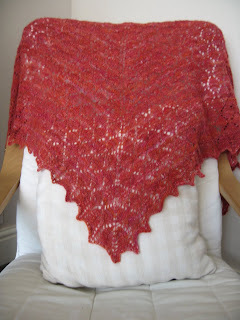 I've finally taken some photos of my Forest Canopy shawl, that I finished early September. It was a really easy pattern but as the number of stitches increased, knitting even one row became a bit of a marathon! I was keen to finish it as I used my own handspun merino and silk yarn in a bright, zingy, orangey, tomatoey colour, and so for me it was finished pretty quickly!! I'm quite pleased with the result and I do feel a sense of achievement making something from a bag of fluff. But I must spin more evenly! When knitting the shawl, the wool thickness varied from lace weight to super chunky in the space of 10 stitches, so I need some practice!! I also was at In Stitches, Beckys knitting cafe, on Friday, where Carrie kindly guided me through a crochet pattern, with much (needed) patience may I add, thanks Carrie!! And when the knitting cafe finished, Becky,Bev,Carrie and I found a local cafe for a coffee, bacon sarnie and, as you can imagine, just a little talking!! All in all, a lovely day! 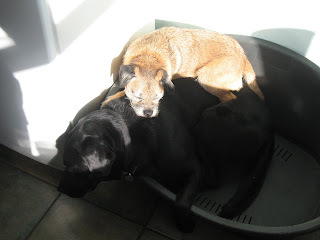 And I must post this picture of Alfie, who managed to climb to the highest point in the dog basket, that is on top of Paddy, to lie in the sunshine! Brass bands and belly dancers! Yesterday I had the pleasure of being around all things sheepy! And I don't include Carrie and Becky in that description!! It was the weekend of Masham sheep fair and the weather was glorious for late September. Carrie and I met up with Becky and her girls and spent the whole day oooing and aaahing over various breeds of sheep, fleeces and fibres. We watched the sheep race, (or should I say we watched a man running with a bucket of food in front of four sheep and three men behind them trying to stop them from running back to the pen, not always successfully) sheepdogs rounding up ducks and geese, brass bands and bellydancers and even found time to have a fab picnic in the autumn sunshine. I was so pleased that we met up with the wonderful Artis-Anne and Tony, ( many thanks to Amber for passing on the S. O. S.!!) it was so nice to see them again and as usual, I could have spent all day chatting to them. Daniela from FeltStudioUK was spinning her wonderful art yarns and I just couldn't resist some of her gorgeous fibres. And I just HAD to buy a 'Know your sheep ' book after puzzling over the many and varied breeds on show! So all in all, it was a brill day, with good company, good food, good weather and when I got home exhausted, it was Goodnight!! 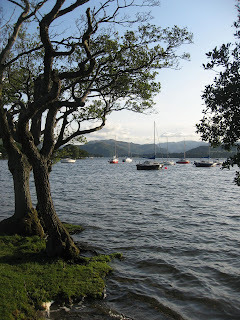 I'm now officially swine flu free and to celebrate the fact, we took off on a last minute camping trip to Ullswater! Yes I did say camping, not the luxury of the caravan or even a tent that you could sit up in but a tent about the size of a coffin! It was supposedly a 2 man size tent but I'm thinking of sueing them under the Trade Descriptions Act!! It was very cosy, cramped, snug and any other euphamisms for too bloody little!! We were like sardines in a tin but with not as much space! But it was so funny! My highlight of the trip was lying in the tent, watching Ian as he tried to take his shoes off and get in without a) kicking me b) rupturing a disc c) putting his head through the tent or d) waking the campsite with loudly expressed expletives!! It took me 10 minutes to stop crying with laughter. Luckily the weather was glorious and while Ian and the dogs went walking, I sat and knitted! 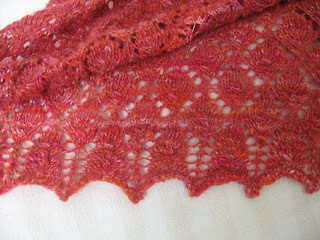 I'm still on with the Forest Canopy shawl that I'm knitting using my handspun merino/silk yarn. I'm pleased with it so far but the yarn is more 'rustic' than I would have liked!! I'll hopefully get it finished while we are in Cornwall, which is very soon, this Friday in fact. We are going in the caravan( luxury!) for two weeks, staying near Perranporth , so fingers crossed for good weather! I'm off now to start the mammoth list writing that precedes any of our holidays! 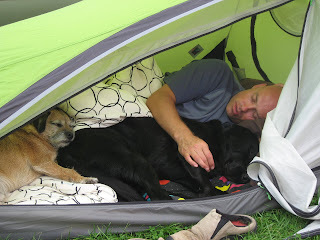 I'll leave you with a pic of Ian, Paddy and Alfie after their Helvellyn expedition last weekend! Maybe the tent should be recategorised, 1 man, 2 dog size!! 50 something year old, Aquarian, chocoholic,stash loving, fibre-aholic crafter.Loves trying new crafts. Mam to 2 children,(well, young adults I suppose! )and two dogs.